The trend for tropical-inspired décor â€” think palm leaf prints, rattan, and anything else that looks like it belongs in a Palm Beach estate â€” hasn’t shown any signs of abating anytime soon. The enduring enthusiasm might be for the way tropical décor makes a space feel sunnier, no matter the season. If you love the idea of the style, but perhaps not the ubiquity of the more popular motifs, we’ve rounded up a few pieces that put a unique spin on the tropical look, indoors or out. A woven base of citrus-colored rope offers lightweight support in this novel outdoor swing. 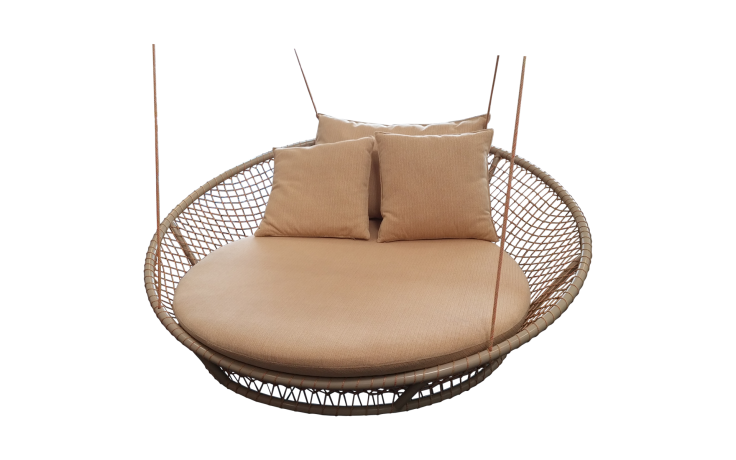 The round shape gives the swing a modern silhouette, while maximizing space so you can lounge in comfort. Though once considered kitschy, mirrors featuring a frame encrusted in seashells have been rediscovered by a new generation of design lovers. For a more subtle look, opt for a mirror with a pieced frame that focuses on the unique patterns of shells (instead of their forms). This vintage mirror features pen shells set off by an unexpected accent â€” coconut shell fragments. Create a one-of-a-kind tropical table with this pair of chic vintage bases. Each features a sculptural bronze figure of a parrot, anchored by a swooping form for a graceful look. As we saw at the Brimfield market this May, rattan is back in a big way. But, you don’t always have to go for the familiar peacock chair or rattan-and-bamboo table. Instead, look for pieces that contrast rattan with an unexpected material â€” like in this sleek chair that pairs woven rattan with smooth leather. You might be surprised at how nicely a “rustic” accessory can easily translate to “tropical”. For instance, this burl wood box recalls the naturally weathered look of driftwood. Palm leaves are the quintessential tropical decorative motif, which makes them easy to overdo. Instead, this vintage chandelier distills the palm leaf into its simple and shapely form, creating an eye-catching element over head. Of course, sometimes you just want to make a statement. The whimsical forms of tropical décor make it easy to go bold, like with this vintage floor lamp that takes the shape of a palm tree.